This easy banana recipe is very similar to bananas foster. It adds some coconut and a bit of grated orange rind to the bananas for added flavor. The recipe calls for rum, but you can see from the notes below the recipe that you can substitute other things and omit the rum. Alcohol free, it’s a great dessert for kids. Combine the coconut, brown sugar and orange rind in a small bowl, mixing it together well. Set the mixture aside. Melt the butter in a large skillet, then add the bananas. Sprinkle with the coconut mixture and 2 tablespoons of rum. Cook over low heat for 3 minutes or until the bananas are lightly browned on all sides. Add the rest of the rum, but do not stir it. Take the pan off the burner. 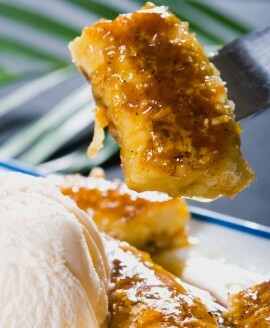 Ignite the rum with a long match, basting the bananas with the sauce until the flames go out. If you don’t want this recipe to contain alcohol, no problem. Instead of 1/4 cup of rum use rum flavoring. Use just a few drops of the rum flavoring as it is far, far stronger in taste than the rum. Of course when you use rum flavoring you don’t ignite it. Just heat and serve. Another great replacement for the rum is caramel. Just add 2 to 3 tablespoons of jarred or homemade caramel sauce to the mixture and heat. You don’t find too many banana dessert recipes, which is why I grabbed this one when someone gave it to me. Bananas are extremely healthy for us. They have no fat or cholesterol and are loaded with Vitamins C and B6. One medium banana also contains 10% of our recommended daily consumption of potassium and 4 grams of fiber. Altogether a healthy fruit that we should include in our diet often. This banana recipe can be served with homemade crepes. Drizzle with caramel sauce or chocolate sauce. 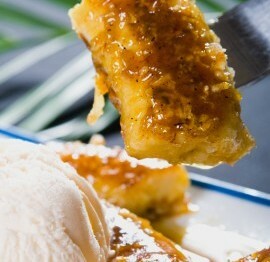 This luscious banana recipe is also wonderful served with homemade vanilla ice cream.